Jack: As Easy Co. approaches the French city of Denille, Nazi flak towers blitz the American soldiers and Sgt. Rock is knocked unconscious. He awakens in the home of a French family where the mother has told her little boy that Rock is his father, who was killed in the war. The family of bakers tells the Nazi commander that Rock is shell-shocked and cannot speak. Rock sees a French underground fighter shot down in the street in front of him and decides to don the garb of a local baker to take over the local underground's mission. Rock wheels a barrow full of loaves of bread toward the Nazi mess hall but instead shoots and kills the Nazi commander before blowing up the flak towers with explosives hidden under the loaves of bread. Soon, the city is liberated and Rock reunites with the rest of Easy Co.
"A Baker's Dozen!" 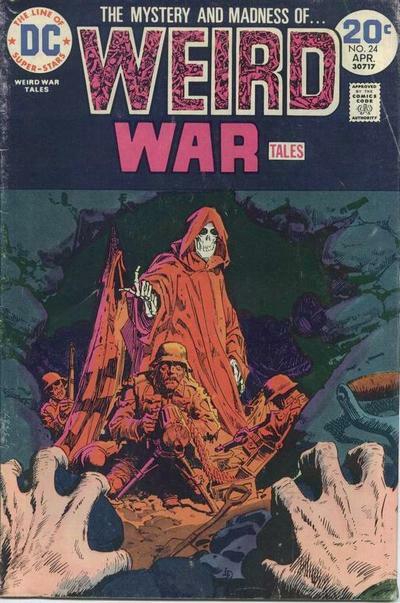 is a fairly good Rock story with pretty good art by John Severin. 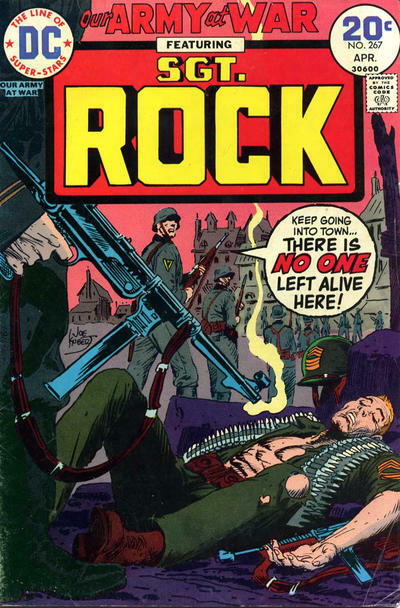 It doesn't make a lot of sense that Easy Co. would be separated from Rock when he's knocked unconscious or that he would be taken in by a French family, and the "gun jump" Rock successfully makes that ends with him shooting the Nazi commandant is ridiculous, but the story is easy to digest. 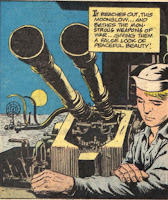 At sea, the "Moonglow" bathes a scene where a submarine fires on and destroys a battleship. 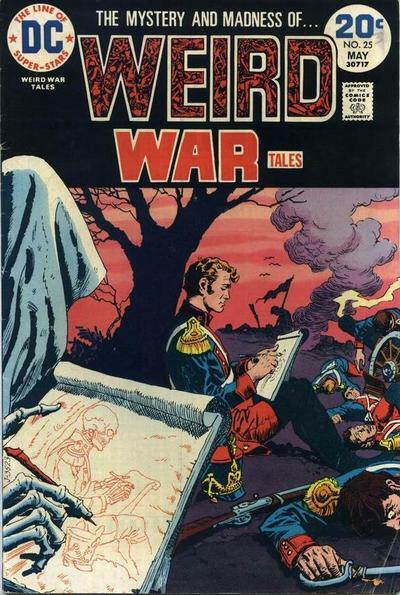 Like so many of Sam Glanzman's short stories in the back of these DC War comics, this doesn't amount to much. Peter: Could be I'm just getting grumpy in my old age but I'm dying to read a really good Rock story and this ain't it. John Severin's wonderful art makes turning the pages easier if I don't read the words, but Big Bob seems to be running out of fresh ideas for his most famous war character (but, to be fair, according to my quick calculations, Kanigher had penned 834 stories just for the Big Five by this point!). Another day, another quasi-romance for Rock, but at least this pretty one doesn't end up dead in a French gutter. Ho-hum. 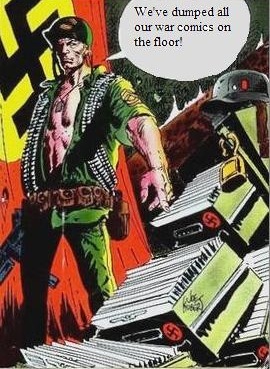 Peter: When a Nazi Oberlieutnant orders the slaughter of a village populace, he is cursed to die by "tiger." Afterwards, the soldier believes he cannot be killed and wanders into each new battle with startling confidence. When his platoon is backed into an underground bunker near the end of the war, he somehow manages to stay alive for ten years before he's dug out. Hallucinating, he flees his captors and falls from a great height, breaking his back... on a statue of a tiger. "The Invisible Enemy" is a mess, in both script and visuals. The story meanders here and there and never once involves the reader, as though writer Oleck had no idea in which to take his narrative. Ernie Chan/Chua's art is equally hard to decipher; a scratchy and, at times, ugly distraction. Much better is "The Last Battle." One hundred years hence, a dictator sees his grip on the nation he rules slipping away and deduces that what the country needs is a good, old-fashioned war. The despot cooks up an impending invasion from Mars and sets out to "destroy" the battle before it begins. 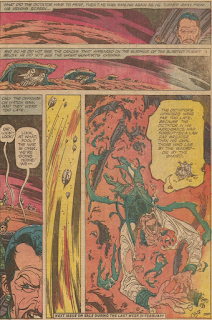 All goes well for the ruler when he gets to the red planet and transmits scenes of fiery carnage back to Earth, but things turn iffy when the people of Mars fight back! I'm not much of a fan of these SF/future war tales (they all tend to be cut from the same cloth), but "The Last Battle" is a darkly funny and clever little yarn and the best Weird War Tale in some time. Jack Oleck goes one for two this issue. Jack: I agree that "The Last Battle" is better than "The Invisible Enemy," but it's the art that makes it worth reading, not the script. Nino is so inventive and his page designs are so unusual that every story he illustrates is a treat. We've seen the old "fake a war to get the people to unite" so many times that it seems trite, but not as trite as the conclusion of the first story. There is actually a germ of a good tale buried deep inside "The Invisible Enemy," but it's overwhelmed by the plot confusion and muddy art. Chua would get better fast and do some decent work on Batman not too many years later. Jack: When Nazis in the North African desert grab a local gal from her horse, Johnny Cloud steps in and saves her. 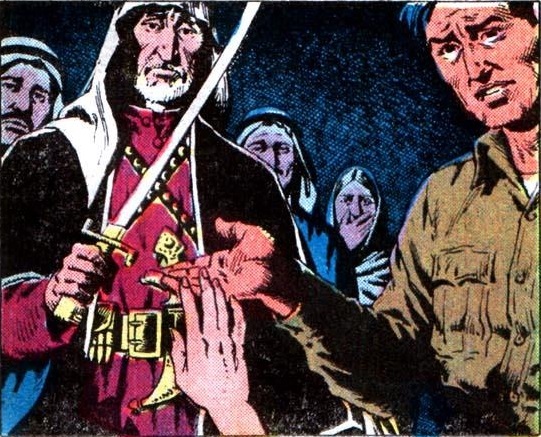 The Losers are invited to her grandfather's camp, where the sheikh tells them that "Johnny-the-Cloud" must now wed Ramallah, since it is written that she will wed the dark stranger from across the sea who saved her. Nazi mortar shells begin to hit the camp and the sheikh is happy to make "The Last Charge!" against the invaders. Ramallah is fatally wounded in the shelling, so Johnny weds her right before she breathes her last; her grandfather is killed in the charge that follows but at least the Losers are able to destroy an old Moorish castle that was serving as the Nazi base. 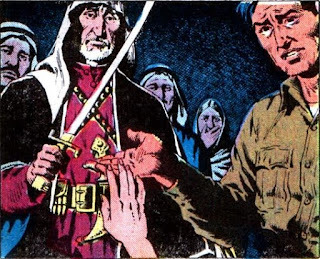 Though John Severin's art is a little shakier than usual in spots, perhaps because he took on too much work (see Our Army at War), the story is exciting and I was touched by the brief relationship between Ramallah and Johnny Cloud. Sure, it's hokey to have them wed as she is dying, but I liked it anyway. 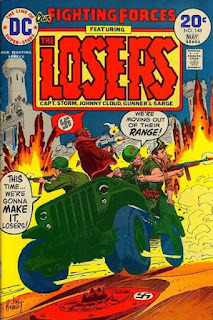 The story opens with the Losers looking for Ona and ends with a caption that says she'll be found next issue. 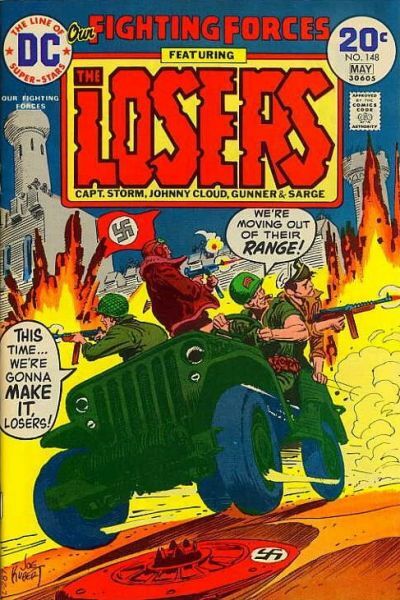 It seems like the missing Captain Storm subplot has been replaced by the missing Ona subplot; in this issue's letters column, Archie Goodwin writes that her relationship with the Losers will take on a whole new turn. I'm intrigued to see what happens. "Toro" is the nickname of a soldier whom the U.S.S. Stevens picks up when it stops at New Caledonia. He is fond of picking flowers and likes to wear plenty of jewelry and comb his hair a lot. When the crew is on liberty at Manila, a surprise attack by Japanese soldiers causes Toro to spring into action; he savagely kills every enemy and dies when he leaps off a cliff after the last adversary. It seems Toro was a Marine trained to be a special killing machine, but he had gone off the deep end and was on his way to a medical discharge. 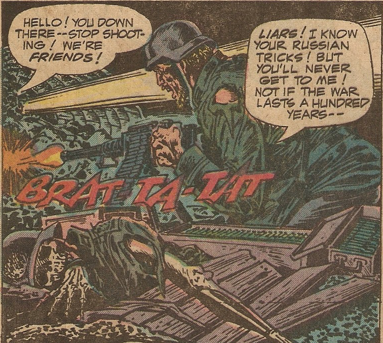 One of the more bizarre stories we've seen in the DC War comics, "Toro" seems to suggest that a savage killing machine goes loony in the head and turns flagrantly gay. "His walk seemed peculiar," reads one caption, and another reports that "he wore a girlish belt." 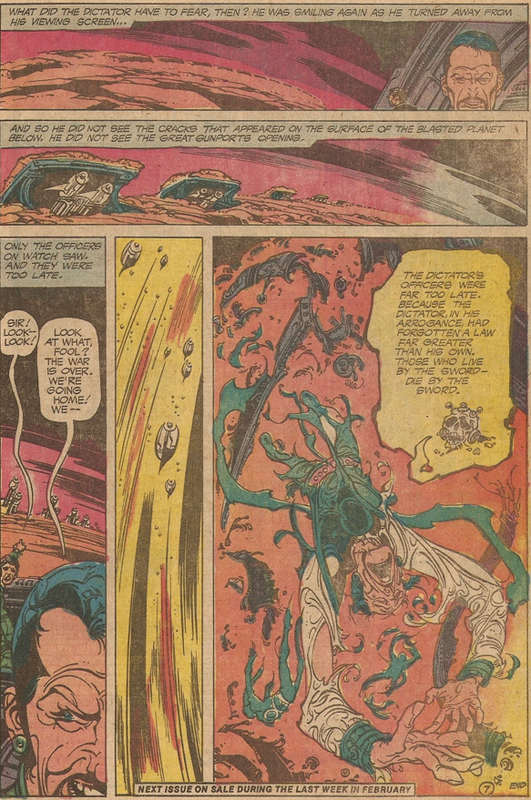 One sailor calls him a "fairy" but Glanzman confuses the reader by drawing an actual fairy flying by on the first page. I really don't know what to make of this story! Peter: "The Last Charge!," probably the weakest chapter of the Kanigher/Severin reboot of the Losers, is hokey to the extreme, like a bad crossover episode of Combat and Rawhide. Complete with the forced marriage we all know will result in a dead bride (and probably no mention of the betrothal in any future installment), the story is vacuous and cliched, the antithesis of what we've come to expect from this series. At least the art is still great! Let's hope the "Search for Ona" arc gets back on track next issue. I didn't know what to make of "Toro," or whether Sam Glanzman's splash (with its very effeminate boy-toy and the oh-so-subtle fairy image) is supposed to be beautiful or offensive. It's a head-scratcher all right, complete with a WTF? climax. Jack: Sgt. 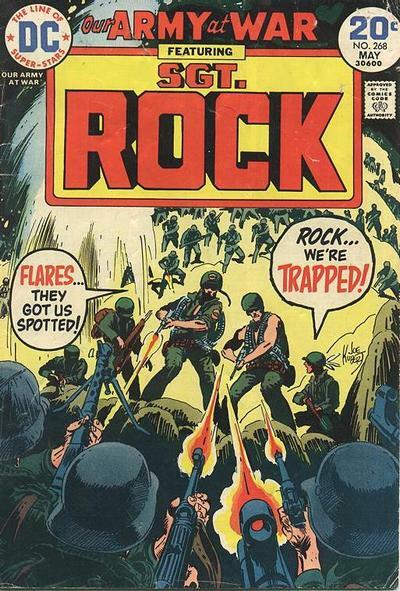 Rock and the men of Easy Co. ascend a steep cliff and have orders to blow up a bridge far below on the other side, but they find themselves shelled by Nazi mortar fire. 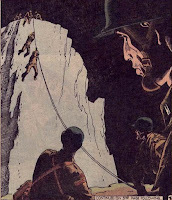 American Rangers parachute in from above to help Easy Co. reach the bridge by means of a strong cable across the chasm, and soon the bridge is destroyed. Easy Co. help the wounded Rangers down the hill to safety and are rewarded with green berets. 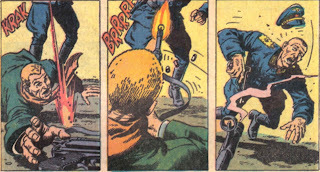 Russ Heath is back, and "The Elite" features wall-to-wall action and minimal dialogue. I was a bit confused by all of the going up and down the sides of mountains, but the art is strong enough that I didn't mind. 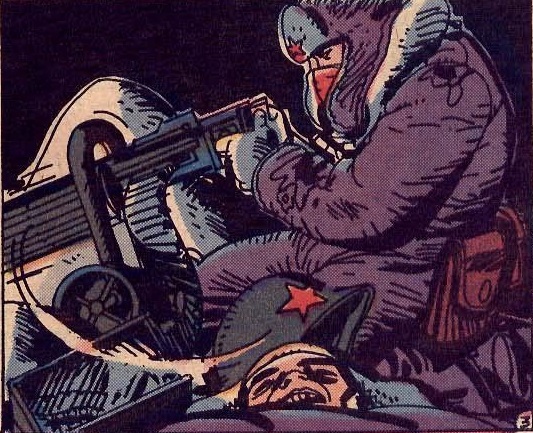 German troops face off against Russian troops in the dead of winter during WWII and the result is "Red Snow." A lone Russian machine-gunner at the top of a hill makes trouble for the advancing Germans but is finally killed and turns out to be a woman with long red hair. I don't usually like Ric Estrada's art in these back-up stories, but this one is better than average. Not much happens but at least there's a minimum of that annoying Estrada caricature. Peter: Seems like it was just at the top of this page that I was whining about the lousy scripts afforded Rock these days, but Big Bob must have heard me cuz he delivers the best Rock adventure of the year. Yep, the finish is predictable, but I really liked the contrast between the seasoned vets and "The Elite" snooty boys. The return of Russ certainly helps as well. "Red Snow" has a good twist in its tail but it's definitely at the lower end of the Gallery of War stories. Peter: Jacques and Marcel are inseparable, even through the horrors of the war they fight for Napoleon in Haiti, and one would do anything for the other. When their troop is ambushed and slaughtered by natives, Marcel is mortally wounded and Jacques calls upon his friend, witch doctor Kwami, to nurse his bosom buddy back to health. Marcel survives but quickly becomes jealous and suspicious of Jacques's voodoo-practicing friend. One night, Jacques cuts a lock from Marcel's hair and heads off into the night, unaware that he'd disturbed his friend's sleep. Marcel follows Jacques to Kwami's hut and observes the pair practicing black magic. In a rage, Marcel strangles Kwami and confronts his soul mate about what he'd just witnessed. Jacques explains that Marcel had died that day at the ambush and Kwami had brought him back to life. The spell broken, Marcel rots away to bones. No doubt Alfredo Alcala's creepy art had a lot to do with my enjoyment of "Black Magic--White Death!," but the story is involving as well. 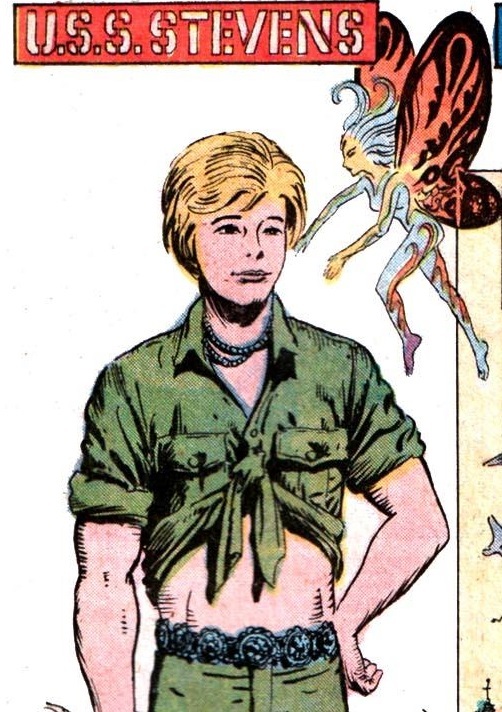 Give writer George Kashdan some extra points for having the nerve to spotlight two obviously homosexual characters in an industry that was, at the time, not the most tolerant of "different" lifestyles. Yes, I agree that the "twist" is predictable but Marcel's disintegration is highly effective in a very EC-esque manner. 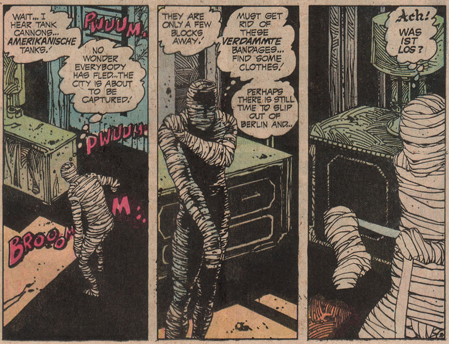 Looks like the Comics Code was starting to let some things slide about this time. A Nazi soldier awakens to find he's been experimented on by brilliant (but mad) German scientists and has been granted the gift of invisibility. "The Unseen Warrior" ventures out into the battle to strike fear in the Allied forces and bring backbone to the failing Axis. One thing you can say about "The Unseen Warrior": it's fabulous to look at. Niño, like Alcala, is funny book M&Ms to me; I just can't get enough of that sweet stuff. The script is not all that great (the plot contains more than a heaping helping of the Universal movie vibe), and the climax is a bit confusing but, in the end, we get two pretty darn good stories this issue and it's been a really long time since we could say that. 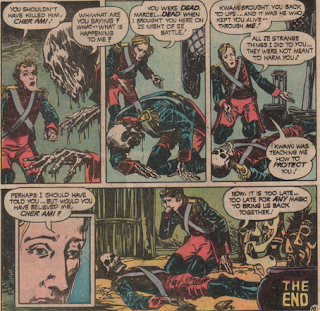 Jack: It's certainly nice to see 10 pages of Alcala art in the first story. I thought the tale meandered a bit on the way to the end but the conclusion was strong and recalls Poe's "The Facts in the Case of M. Valdemar." Equally well drawn is the Nino story, making me wonder why they keep relegating Alex to the back of the book. The confusing plotting dooms this story but it doesn't dim my enjoyment of the pictures. 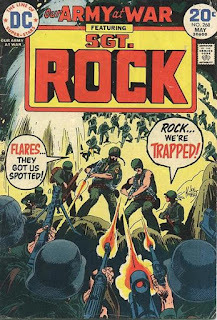 You didn't understate when you said that DC emphasized St.Rock over our Army at War in later years. This looks ever more like typical superhero comics. I am waiting eagerly for your take on Warren. I have quite a few of the magazines in my collection. Still re-read them now and then. Today I think a lot of the writing is not very good. But the art is often timeless, especially after the spanish artists came. I think I've said before but, just in case, I didn't, I've read the Eeries and Creepys full runs at least twice (once as they came out and once when I did some pieces for an overseas zine). The early issues are okay and then there's a really really bad dip in quality when Warren was having financial problems. 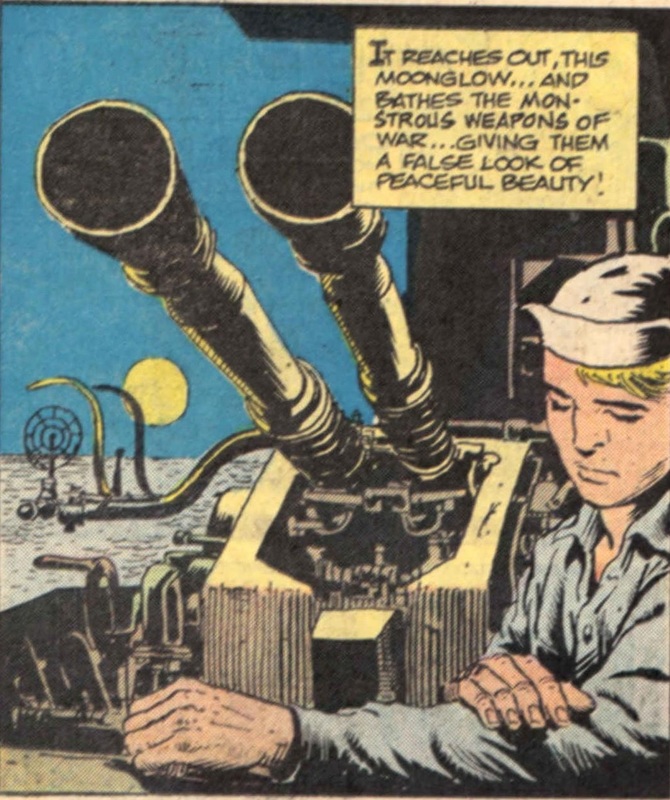 By 1971, the ship had been righted and (like DC) the influx of foreign artists really propelled them to what I think is Warren's "Golden Age" of 72-77, Then back to the quagmire. 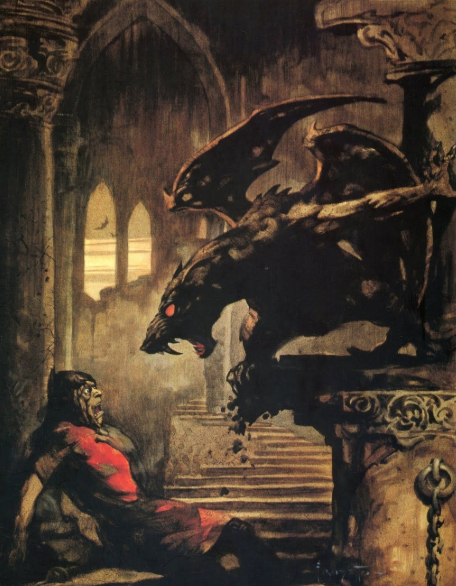 I've never read Vampi, The Rook, 1984/94, The Spirit, or any of the other short-runs so that's uncharted territory. Hope I didn't give away the O. Henry climax with all that detail!